Apparel production, also known as garment production is a process where fabric is being converted into garments. The term apparel production is basically used when garments are manufactured in a factory. Traditionally apparel manufacturing factories has been divided into two sectors as domestic and export. A factory produces bulk quantity of garments for a style or design at a time. Prior to start production of an order factory needs to gone through some activities which is known as pre-production. Pre-production process includes sampling, costing, production planning, sourcing of raw material and production pattern making. Fabric cutting, printing, embroidery, sewing, thread trimming, washing, ironing, folding and packing are the production functions. Sampling is a process where factory develop garment samples according to buyer's specified design. This is also known as product development stage. Samples are required at various stages to get approval from buyer on a particular design. As per the development stages samples are named as Proto sample, Fit sample, Size set sample, Sales man sample, production sample, Top of production (TOP) sample and shipment sample. A business is all about making profit. So correct costing of a product before order finalization is very important. Costing of garment is the cumulative cost of raw materials, direct labors and direct and indirect overheads. After developing sample or directly receiving buyer's sample factory needs to send FOB (freight on board) price of the garment. 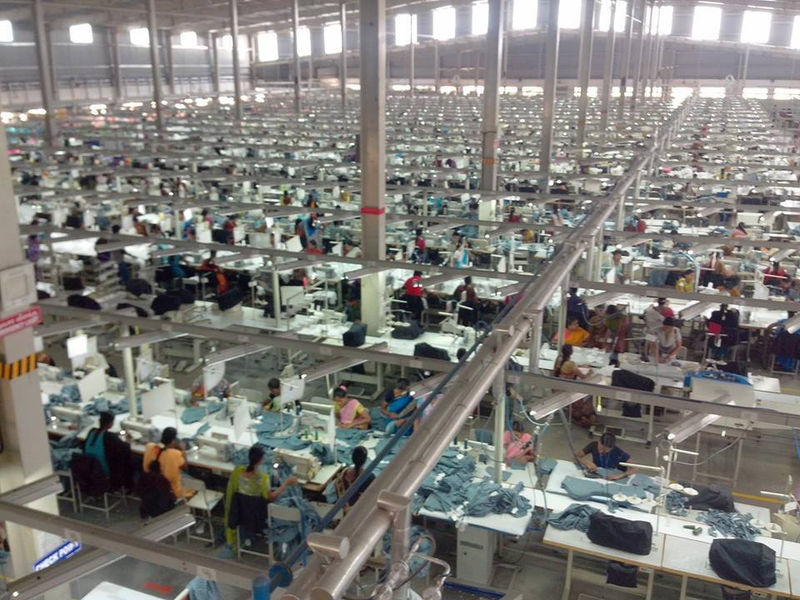 To decide FOB of a garment factory makes cost sheet including raw material cost, total of direct labour costs of each processes, factory overhead. An FOB is the sum of garment cost, factory margin and taxes. After receiving the order factory plans for raw material requirement for the order. Raw materials like fabrics, sewing threads, packing materials, hang tags and other accessories. Factory plans timelines like when to start cutting, when to submit pre-production sample, when to finish sewing and finishing, final inspection date and shipment date. In production planning stage job responsibility for different processes is defined. In this stage fabrics are layered on a table layer by layer up to a certain height. Then by means of a cutting machine fabric are cut into garment shapes or pattern and separated from the layer. Fabric layering is possible both manual spreading and automated spreading. Cut parts are then numbered and bundled and send to sewing room. For details about cutting process see cutting room overview. The quality of end product (garment) is very much depends on the good cutting quality. Secondly, fabric the main raw material of the garment represents about 70% of total garment cost. That is why cutting is an important process like others where control the fabric saving and garment quality. Garment panels are stitched together in sewing room by means of sewing machines. In sewing 2D fabric patterns are converted in 3D forms. An operator run the machine and using sewing threads garment parts are joined together. Various types of sewing machine are available for sewing. Machines are selected according to the seam and stitch requirement. In industry traditionally sewing machines are laid in a raw. Cut parts are feed at the start of the line, passed through the line and at the end of the line a complete garment come out. Each machine is run by individual operators and an operator sews only one or two operations of the garment. A line consist of sewing operators, helper to feed them with cut parts, thread and other trims, quality checker and one fully or partially devoted supervisor. After stitching, all hanging thread are cut by means of hand trimmer. Auto thread trimming machines are also available to perform this task. All loose threads inside a garment are removed as well. Garments without any loose thread and long tail are basic quality requirement. This process is performed when buyer want washing or special finishes to the garments. For light color garment washing is carried out to remove dirt and stains though buyer does needed washed garment for orders. Generally this process includes checking of garment, measurement checking, ironing, and spotting. After sewing of the garments, all pieces are checked by quality checker to ensure that garments are being made as per buyer quality standard. Checking normally is done for visuals appearance and measurements. Spotting is required to remove stain in the pieces. Various chemicals (solvents) are used to remove various kinds of oil stain, marks and hard stain. Each garment then ironed to remove creases by means of press. Each pressed garment is then folded with tissue or card board. Folding varies product to product and also buyer to buyer. Hang tags, special tag and prices stickers are attached with plastic Kimble or threads. Folded and tagged garment are then packed into poly bag. During packing garments are randomly checked by internal quality controllers to ensure that only quality goods are being packed. Once garments are packed (also known as shipment), before dispatching quality inspection of the garments is carried by buyer quality assurance (QA) department. Many times a third party quality auditor is hired for this final inspection job. If the packed goods meet the buyer’s quality standards, shipment is accepted by buyer. Factory then dispatches goods to the buyer. An overview of garment manufacturing industry.List of garment manufacturing processes explained briefly.